Watch and see in this time-lapse video, rodents consuming Revolver Soft Bait and leaving behind the bromadiolone wax blocks. 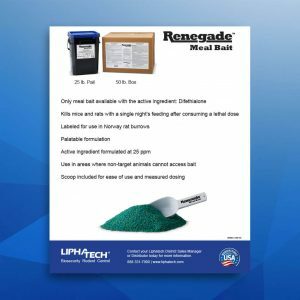 When you need a bromadiolone rodenticide in your rotation, make it Revolver Soft Bait! We placed large amounts of FastDraw® Soft Bait in an active dairy barn infested with both rats and mice. Despite the alternate sources of food, the rodents went for the FastDraw. See what happened next. We placed large amounts of Cannon® Soft Bait underneath an active dairy barn infested with rats. See for yourself how the rodents went for the soft bait, despite alternate sources of food. Only meal bait available with the active ingredient difethialone. 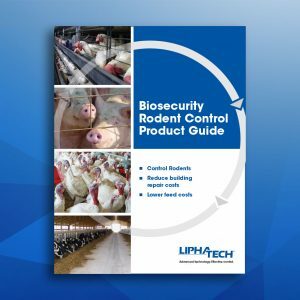 Product information on Liphatech's biosecurity rodent control products, including FastDraw®, Revolver® and Cannon™ soft baits, Hombre®, BootHill® and Gunslinger® baits and Aegis® bait stations. 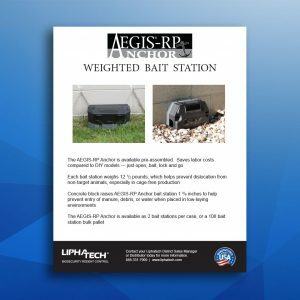 The Aegis®-RP Anchor comes pre-assembled with a concrete base, saving you labor costs compared to DIY other models — just open, bait, lock and go.